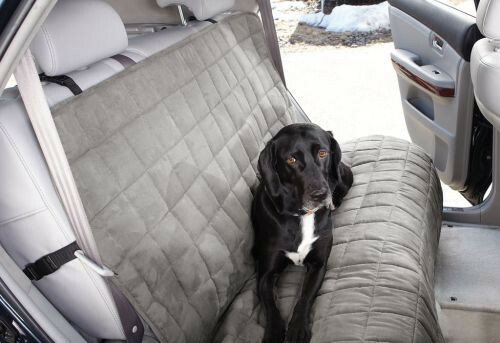 Back Seat Dog Cover, by Sure Fit, is a practical and stylish slipcover that offers a solution of waterproof suede to your vehicle to protect upholstery from pet hair, paw prints, moisture and debris. The laminated backing and bound seaming combine to prevent leaks, while the 4-inch box quilting and lofty 5 oz. polyester fill add cushiony comfort. 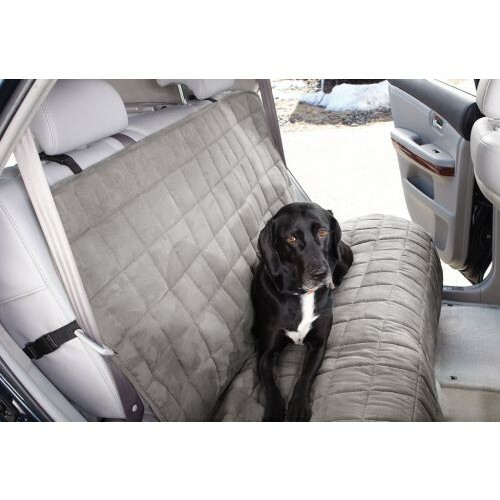 Back Seat Dog Cover extends over the sides and front, and is held in place with an adjustable horizontal back strap and vertical sliding straps. The bench seat cover is available in two sizes to accommodate most sizes of vehicles. Practical, Stylish Waterproof Suede Offers Vehicle Upholstery Protection. Laminated Backing and Bound Seaming Prevent Leaks. 4-Inch Box Quilting and Lofty 5 oz. Polyester Fill Add Cushiony Comfort. Bench Seat Cover Extends Over the Sides and Front and is Held in Place with an Adjustable Horizontal Back Straps. Available in Two Sizes to Fit Automobiles, Medium (48 Inch - 54 Inch) and Large (58 Inch - 64 Inch). Material: 100% Polyester with 100% Polyester Fill and 100% Polypropylene Backing.